First-Past-the-Post produces distorted election results with more than two parties. We need to modernize our voting system. Either Proportional Representation (true voting) or Ranked Ballot Voting will work. Which do you prefer? Ever since NDP leader Tom Mulcair promised Canadians a scaled-down version of Quebec’s $7-a-day childcare, Quebec’s universal model for daycare benefits has come under renewed attacks from free-market economists. Esteemed economist Stephen Gordon says Quebec’s model is “regressive” and goes so far as to claim its supporters are “intellectually bankrupt”. He resorted to similar acrimony attacking tuition cuts, opponents of FIPA and hikes to minimum wage. Before challenging the claims of small-government experts, let’s see how we rank in social spending, childcare subsidies and pre-primary education compared to other developed countries. 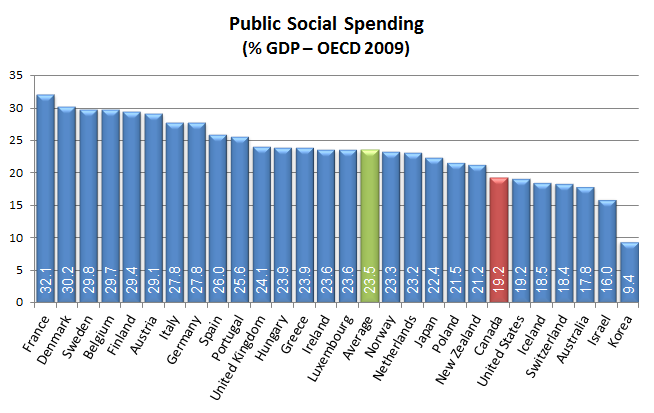 Source: OECD Social Expenditure Database. Every percentage point of GDP equals $18.8-billion. The 4.3 point gap from average means that our social spending is below average by $81-billion a year. 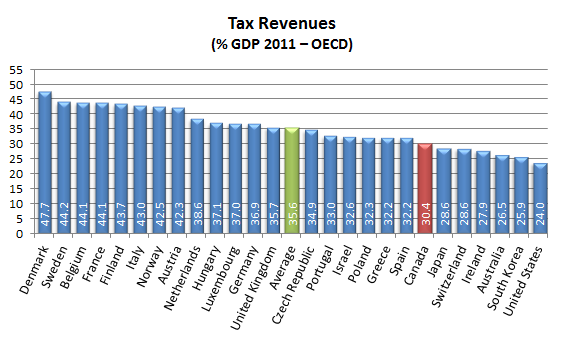 Source: OECD Family database (PF3.1). The 0.34 point difference from average comes to $6.3-billion a year. After decades of “starve the beast” tax cuts — and the consequent social spending cuts — we have fallen to the bottom of the class. Quebec setting a bad example? 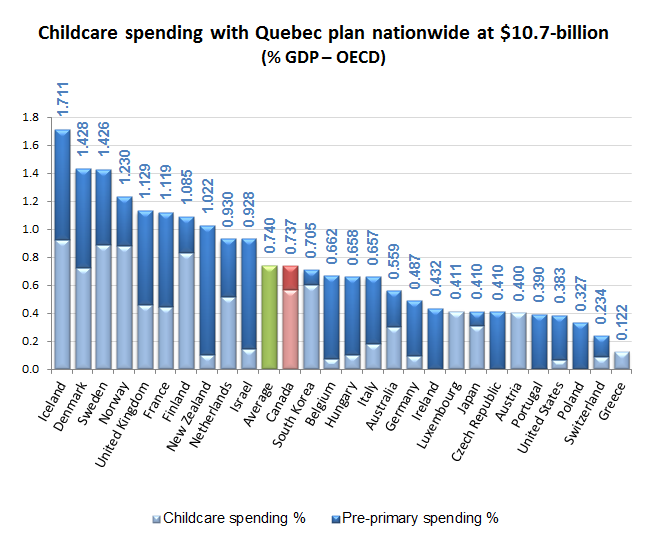 Our low score on childcare spending would be much worse if it wasn’t for Quebec. They spend 60% of our nation’s total on childcare. Without them, we’d come next to last. But according to free-market economist Stephen Gordon, Quebec is the problem. In an economics blog — where he claims Harper’s Orwellian-titled “Universal Child Care Benefit” meets the criteria for progressiveness — he criticizes Quebec’s $7-a-day plan for being regressive. First, the “average subsidy received” is a nonsense number. Every family received the same amount per child, which was $6,600 back then. Second, it’s not surprising the lowest income group used the daycare benefit the least. This includes families with providers who are part-time workers (often unwillingly) as well as those who are on unemployment insurance, welfare and disability. There may be one stay-at-home parent, which means the family doesn’t require daycare. Or money might be so tight even $7-a-day is too much and they rely on family for free childcare. Third, if both parents are employed full-time — even at minimum wage — they will no longer belong to the bottom 25%. So daycare benefits actually lift low-income families out of poverty. To better help out low-income families, free daycare spaces can also be provided. This would be especially helpful for single mothers who want to increase their living standards by working instead of relying on meager social assistance benefits. By 2008, about 70,000 more women with young children had entered the workforce who would not otherwise have been working, a 3.8 per cent increase, [economics professor Pierre] Fortin found. The ripple effect of their employment pumped an additional $5.2 billion into the Quebec economy, boosting the province’s Gross Domestic Product by 1.7 per cent. The increased economic activity, which includes mothers’ income and consumption taxes, more than covered the province’s $1.6 billion annual child-care costs that year. (The province subsidizes each spot by about $10,000 annually.) And it poured more than $700 million in additional revenue into federal coffers. 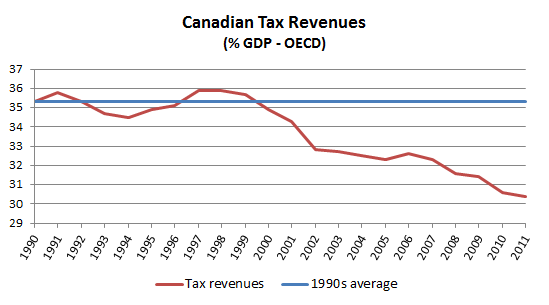 Economists who criticize Quebec’s plan for being “regressive” are bad at accounting. They ignore how the subsidy is funded: through progressive taxation. To see how much free money the rich would really get under a national daycare program, let’s expand Quebec’s program nationwide and break down the costs. Quebec is upgrading its program to 250,000 spaces to meet demand. Extending their plan nationwide would require about one million childcare spaces. Quebec spends about $10,700 for each childcare space. So federally, this would cost about $11-billion a year. Does that sound high? 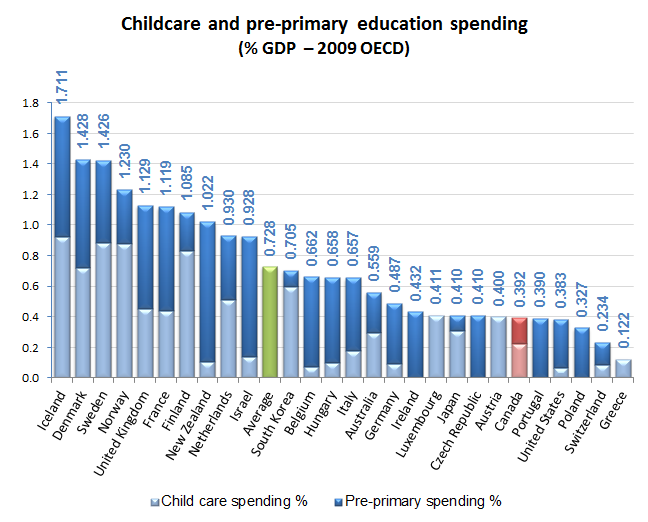 At 0.58% GDP that would be less than what South Korea spends on childcare. Another way of putting this in perspective is comparing this spending to Harper’s tax cuts. Since coming to power, Harper has cut taxes by $45-billion a year — real free-money giveaways to the rich. Although these tax cuts did nothing to boost anemic economic growth, expanding Quebec’s daycare federally would cost a fraction of the wasteful tax cuts, provide a much-needed service and produce actual economic benefits. Daycare subsidies act like an insurance policy spreading out the cost — people pay in before and after they use it. Childcare spending is also a good way to help low- and middle-income families struggling with high debt loads and falling real incomes (adjusted for inflation). To get an idea of how much each family would pay for an $11-billion daycare program, personal income taxes make up about 41% of federal and provincial general revenues. That would mean income taxes would pay for $4.5-billion of $11-billion. Clearly the wealthiest don’t benefit the most. They pay a lion’s share of the cost because they make a lion’s share of the income. Quebec’s daycare spaces are expensive! At a $10,700 annual subsidy plus the $7-a-day charge that adds up to $12,520 a year, or over $48 a day. Daycare costs in Ontario are around $31 a day. If costs could be brought down to $35 a day, the total cost would be reduced from $11-billion a year to $7.3-billion a year. To keep costs down, daycare could be broken up into two groups: basic and premium. Like the government dictates what doctors can charge per visit, it can also cap basic child care spaces at $30 a day, where the charge to parents is $7. Then a fixed number of premium spaces could be allowed to charge $45 a day and higher. Wealthier parents would get the same subsidy as everyone else — $23 a day — but pay a higher charge: $22 a day and up. That would cut costs to $6-billion a year. The top one per cent of Canadian families — those earning at least $266,000 — paid 30.5 per cent of their income in taxes in 2005. That was less than any other income group — even the lowest. 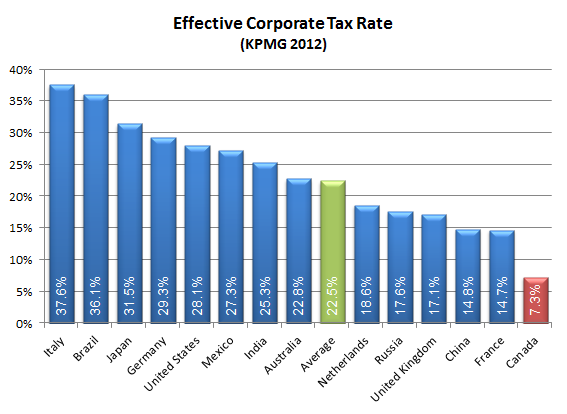 Our effective corporate tax rate is so low because of 50% in corporate tax cuts since 2000, plus many corporate subsidies including $2.8-billion a year in tar-sands subsidies. 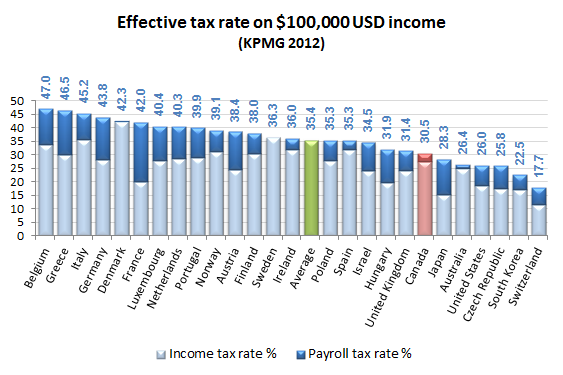 Source: KPMG’s Individual Income Tax and Social Security Rate Survey 2012. The 4.9 point difference between what we collect in taxes now compared to what we collected in the 1990s amounts to over $92-billion a year in lost revenues. Why do right-wing economists claim universal benefits are regressive and only help the rich? Why do they claim it’s better to help the poor directly? In short, their economic policy is agenda-driven. Here they are trying to divide and conquer society by pitting middle-income earners against low-income earners and centrists against progressives. Low-tax economists know that under budget constraints the poor are the first to come under attack with little media attention. Society is united with universal benefits. They also justify additional spending to better help low-income families. Over the past 35 years, real incomes (adjusted for inflation) have fallen for all but the wealthiest Canadians. Unlike the centrist Keynesian era (1945-1980), all segments of society are no longer benefiting from economic and productivity growth. To level the playing field, we need to increase public benefits so Canadians have more money in their pockets. This will not only raise living standards, it will boost economic (GDP) growth — now the lowest its been since the Great Depression. The low-tax, small-government, free-market reforms of the past 3 decades have been a colossal failure. It’s time to turn the tide. We need to bring back postwar levels of progressive taxation and restore our Just Society. Annual daycare costs are based on 260 childcare days per year. Ron Waller, thank you for leaving a comment on my blog under "We are not alone in this universe". I have asked some question in response to your comment. I will appreciate your response to those questions whenever you have time. The Quebec daycare system is a private-public partnership, and there has been a lot of corruption. Licenses being handed out and then resold for a profit. It is a very lucrative business. Also, it appears that it is being used disproportionately by higher wage earners, while many who really need it, are on waiting lists. Your figures are informative though. Just not sure other provinces will be willing to sign on, unless it is a truly income based plan. Ontario has already said no. I agree that a daycare plan is long overdue. Just not sure Quebec's is the best model. Hey, Waller. Did you catch Krugman's take on Trudeau in today's NYT? It was a wonderful thing to send Harper packing. Saving Canada from a Mulcair government was icing on the cake. What is a false majority? As a non-partisan electoral reformer, I support both of the main democratic voting systems: Proportional Representation (true voting) and Ranked Ballot Voting. Either system will ensure an actual majority is represented in government and the real will of the people is carried out. It's up to Canadians to decide which system is best. Together we can make it happen.